Sumbission for Songtember Jam #1. A maze game with a music theme. Cool game! Thank you so much for english version! Oh, so great, thank you! After the english translation, I offer to translate to Portuguese, if you wish so. Can't vote but would give this game 5 stars. Mechanics are interesting and it is visually fun. hahaha, nice. It was a little repeating though. Thank you, it was fun, looking forward to create another one, now that I learned a bit. Maybe it was fast, but has a nice base sound. Not so much for the distorted (piano?) sounds you added latter, but it is a matter of taste. Can late ones like me still join? Is one per day mandatory? Because I am afraid to miss some days. Tha game should be made in pixel art? Or any kind of design is fine? Nice game, enjoyed the controls very much! What a funny end! And loved the waving grass too. What a nice positive story! Loved the pixel art too! Loved the little game and very cool tracks! Good musical taste! Loved to play this game. Is very well made, and very clever. I loved the tree level, quite chalenging! Was about to give up when I figured out where to go. Note to self for next game: check out image-to-bitsy here. In my game I used audacity to create a wave file, so it could work across most browsers. When I tried it offline, it didnt work, but worked once I uploaded it to itc.io. Thankd for the image-to-bitsy tip, will check it out for sure! I just created a game with background music on Bitsy, using this solution here. Lovely poems and great pixel art! Have you tried this solution here? For me, it worked (only when online), Also, you can loop it. Loved the message and your pixel art too! Day 1 - Started to learn what could be done with Bitsy. Reformulated original idea game, because sounds are not yet implemented in Bitsy. Will try to put a loop music on the game using the solution provided here by the creator of Bitsy, Adam Le Doux. 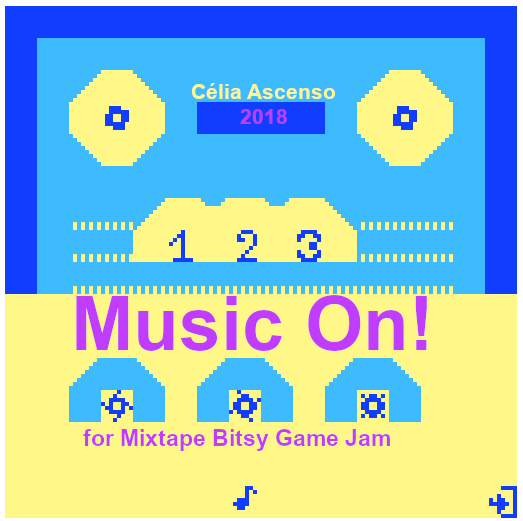 Bitsy Game Jam Mixtape rules and submissions here. Day 2 - Decided to use original room idea to pick discs to play some music, and by doing so, we will enter on a room related to the disc theme. On the room there is an image with a hidden labyrinth to be solved. Not sure if a different music can be looped on the background of each room. Will stay with the same for now. Room maze 1 was created. Day 3 - Created maze room 2 and 3. As I was away from the PC, I used Pixel Studio on android in a 16x16 window to create the image/path. On Bitsy we have up to 3 colors per room, for background, tiles and sprites. I played a little with collor palettes for each room. Day 4 - Tried to create quick original music with Lmms to loop on the background, but my lack of experience with Lmms only allowed me to make horrible music, so I edited "Sonata for Two Pianos in D major, from Mozart" that I downloaded from Wikipedia. Used Audacity to loop 30 seconds of a little bit that sounded good enough to me. Update: Maybe I should have left a little more than 30 seconds of music, getting annoying to hear the same again and again. Will upload a music I create at a latter stage, maybe. Cool! Loved to walk on the clouds and almost being bitten by the duck! Nice, Loved the little underground adventure! Thanks. It costs us nothing and we still learn in the process. There are not many games thinking in people having a hard time controling the mouse or a keyboard, and some are really expensive, as it is a small market comparing to the majority of the gamers. I like to make colorful things, so this goal was achieved. I also improved my Game Maker drag and drop skills. -The UI and The End are missing. -The sounds for each scale are missing. -Clickable effects like bubbles coming out of the fish, and eye closing are missing. -The scales do not go back to its original place when not matched, need to fix that, maybe assigning a profundity level for each of them (on Game Maker). Not sure if it is possible, as each pair is an instance of the same object, and the levels are placed on the object. -Need to add an escape button to exit game. Clicking the button will make it select another scale, waiting will select current scale. When scale is selected, just keep clicking until matching scale is selected and wait. -I need to make also alternated keyboard control for blind persons. Scales can not be seen, but each one has a random key (QWERTY and so on) assigned to them with corresponding sound. When sounds selected are not matching, they make a Fail sound. agree that you could work more on the images, as you have good ones mixed with bad ones, and so so one. The corals are looking good, the algae that have movement could also be 3d, and the little green cubes I imagine them as rocks. That's the major thing I see that could be improved. I think bloop game should be finished, as it is so positive and fun. I agree with all the implementations you plan to make, it has a lot of potential. Thank you :D I just love colorful things. Thank you :) Will be updating with more sounds for each scale. Hi, loved that it can be upgradable, because my fish was too slow for the piranhas. The major no is the music. Please add an option to disable it, or make it more pleasant. It is a good SFX for horror or danger, but looping is very unpleasant. Just loved the game, the fish is just cute, and the music has a happy mood. Day 6 - Creating all the game mechanics on Game Maker using drag and drop only. Added some sounds to selection, just in time for uploading to optical game jam. Important things missing: The end of game effects. Others: sounds, animation effects, info. HTML5 Verison. EDIT: Forgot to upload the game, just done. Ops. Awh! The yellow fish is really cute, and the music has a happy mood!